I turn to see the naked figure of a man standing on the edge of my raft. He is new to the server – a fact betrayed by his lack of clothes and low level. I question whether I should ignore his request, take him out to sea and push him overboard, but gradually think better of it. Instead, I hand him some pants and a cloth shirt and take him under my wing, transporting him wherever he needs to go. Travelling along the coast, I pull in close to the beach and soon another person jumps aboard. Then another. And another. Pretty soon, I have assembled a small crew. They ask me about my screen name – a play on a popular character from the The Secret of Monkey Island – and I answer with my best pirate accent through my microphone. It wins them over, so I bark some orders and set a course for Far’s Peak: as far as they are concerned, I am the mighty pirate LeChuck. I am always trying to find a new way to play games. In the past, this has led me to pursue pacifist runs and self-given quests to collect every available item. 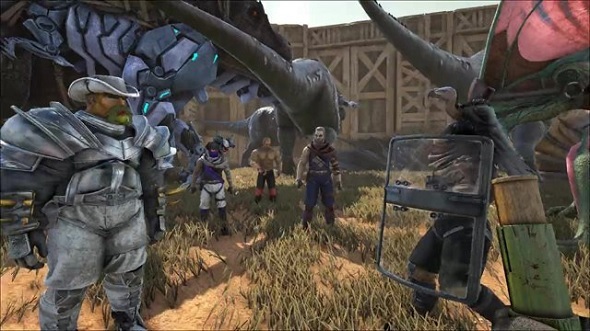 Recently, though, I have turned my attention to roleplaying in Ark: Survival Evolved. As you can tell, it happened quite by accident, but it has since become one of my favourite activities in the game. Ark is the perfect container for a roleplaying vocation. You only need a cursory look at the mods on Steam Workshop, or to glance at websites like TwitchRP, to see the vast number of resources available to anyone wanting to roleplay inside the game’s online world. There is a huge community out there, with popular Twitch streamers sharing their characters online to thousands, encouraging them all to join the theatrics. GameWithMe, who prefers to go by his screen name, is one such streamer. Along with a bunch of other content creators, including Joefudge, Tessann, OldLadyGamer, and Shortyhage, he is responsible for maintaining TwitchRP. 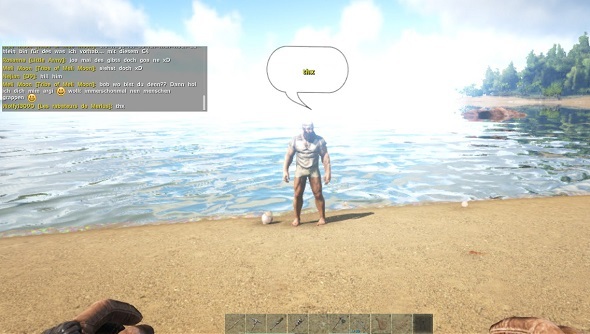 He has also been roleplaying in Ark from the moment he picked it up. He believes the uptake of games like Ark: Survival Evolved in the roleplaying community is due to its immense variety of environments, items, activities, and the amount of user-generated content available. Even in the base game, Ark’s weapons range from crude weapons and tools to futuristic Tek rifles and machinery. 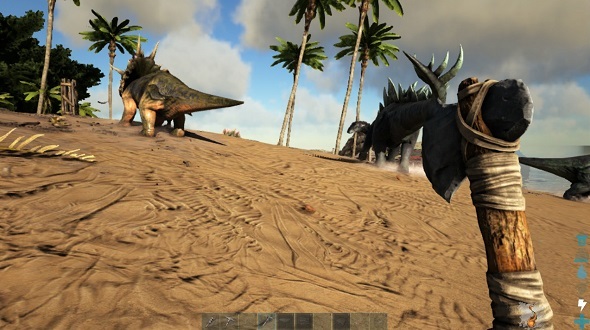 “Ark provides the perfect stage for so many different types of roleplay,” he explains. “I’ve seen and participated in medieval roleplay where the tools and weapons are all primitive, all the way to futuristic settings where there are laser guns and underwater bases. While my own experiences roleplaying so far have been pretty basic, mostly relying on getting people drunk and running a successful boating empire, GameWithMe’s attempts show how far you can push the game’s systems with all the crazy antics he gets up to. He has roleplayed multiple characters in Ark, but his most memorable persona is the bloodthirsty warlord Kermy Drogo – a combo of Game of Thrones’ Khal Drogo with Kermit the Frog. Along with his Frog Riders, his very own version of the Khalasar, he started a full-scale war on his server, resulting in a bizarre battle where orders were given in the iconic frog’s phlegmy accent. It is these stories and random encounters that encourage me to continue roleplaying. I want to see how far I can actually go with my character and what personas I can come up with next. For those just getting started like myself, GameWithMe has some tips you would be wise to take onboard.